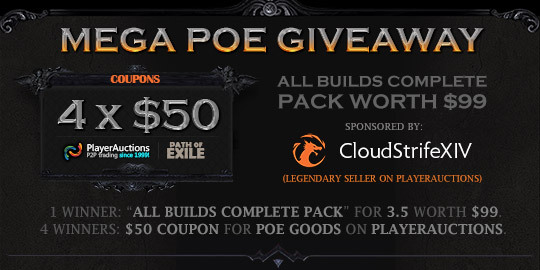 Prize: 2 winners will get $60 each to purchase POE 3.6 Synthesis Supporter Packs. 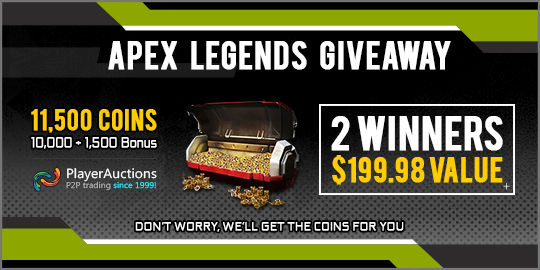 Prize: Two winners will get Apex Legends Coins worth $99.99 each. 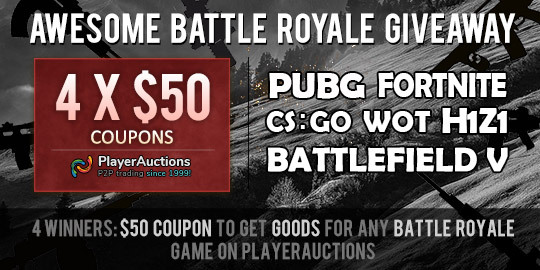 Prize: Each of the four winners will get a $50 coupon to shop for goods on any of these Battle Royale games PUBG, Fortnite, WoT, H1Z1, CS:GO, Battlefield V, on PlayerAuctions. 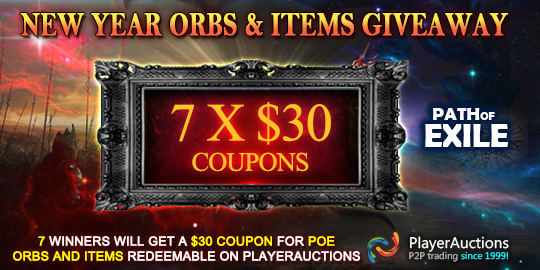 Prize: One winner will get “ALL Builds Complete Pack with Items + 20 % Gems + Jewels + Flasks Betrayal League” worth $99 and four winners will get a $50 coupon to shop for Path of Exile Orbs, Items, Accounts, Powerleveing, Silvercoins etc. on PlayerAuctions. 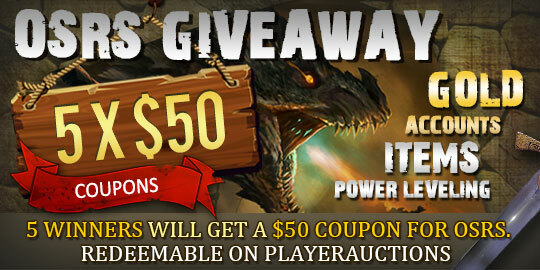 Prize Each winner will get a $50 coupon to shop for anything on PlayerAuctions. 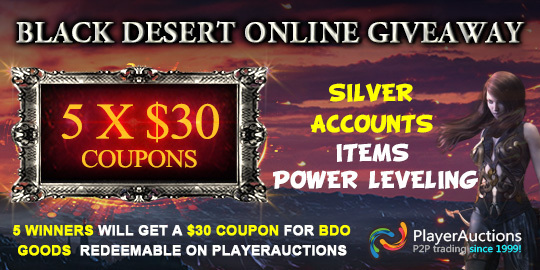 Prize: Each winner will get a $30 coupon for Black Desert Online. 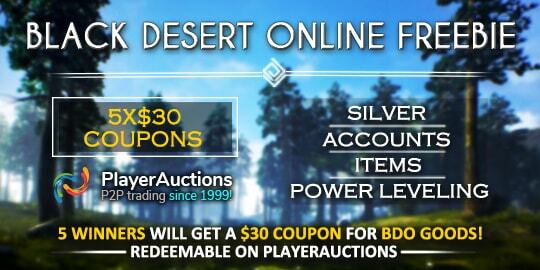 The coupon could be redeemable for any BDO Silver/Accounts/items/Power Leveling on PlayerAuctions. 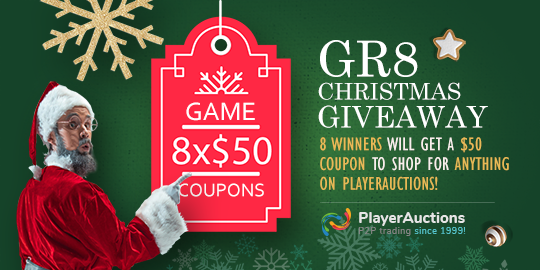 Prize: Each winner will get a $20 coupon for Rocket League. 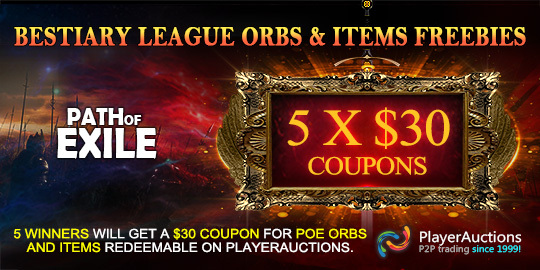 Coupon could be redeemable for any Rocket Leauge Items on PlayerAuctions. Prize Each winner will get a $30 coupon for Old School RuneScape. 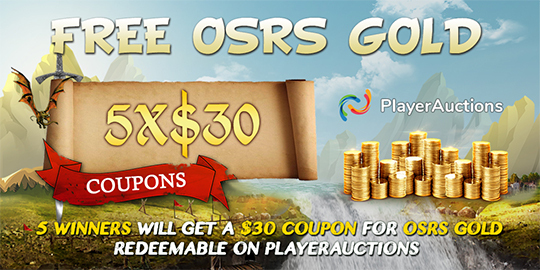 Coupon could be redeemable for any OSRS Gold/Accounts/Items/Power Leveling on PlayerAuctions . 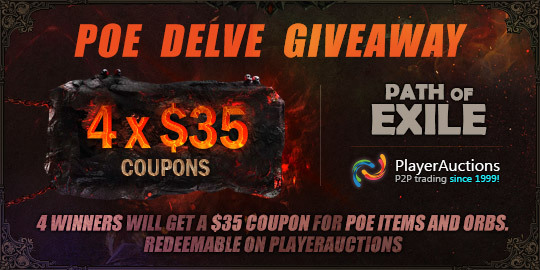 Prize: Each winner will get a $35 coupon redeemable for any Path of Exile Items on PlayerAuctions. 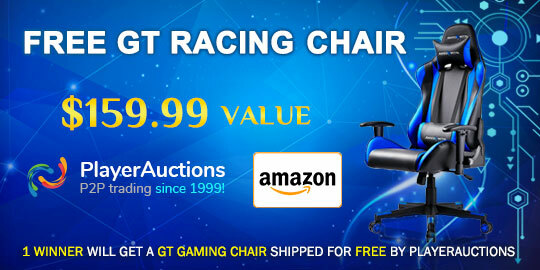 Prize 1 winner will get a new GT Racing Chair delivered for free. Number of Winners 1 person, who follows the required entries, will get randomly chosen. 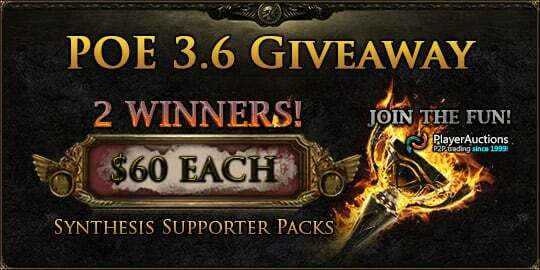 Prize: Each winner will get a $30 coupon redeemable for any Path of Exile Items on PlayerAuctions. Number of Winners: 1 person, who follows the required entries, will get randomly chosen. 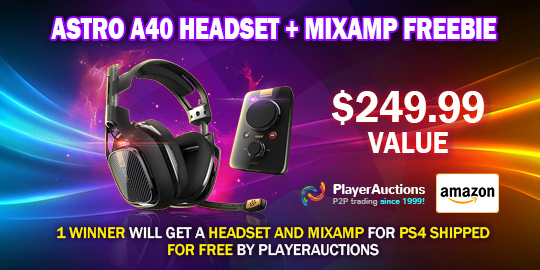 Prize 1 winner will get a new Astro A40 TR Headset + MixAmp delivered for free. 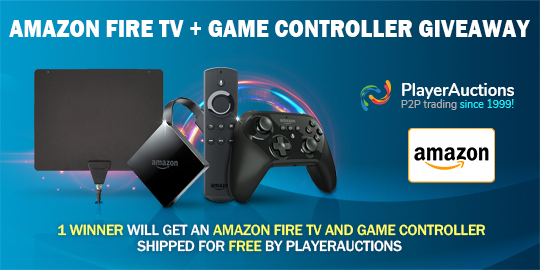 Prize 1 winner will get a new Amazon Fire TV + Game Controller delivered for free. 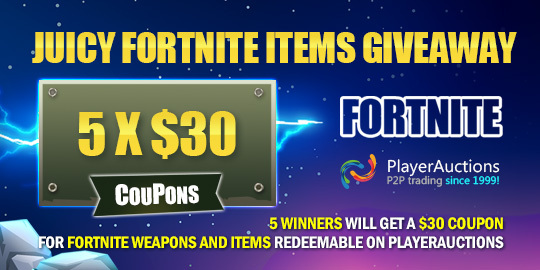 Prize: Each winner will get a $30 coupon redeemable for any Fortnite Items on PlayerAuctions. 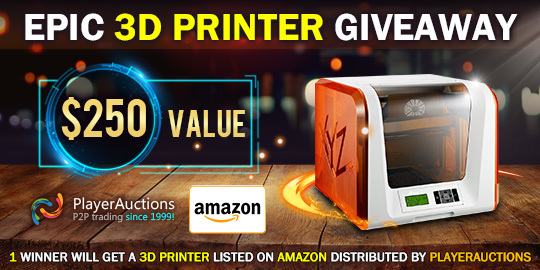 Prize: 1 winner will get a new $250 DaVinci 3D Printer (professional installation service and add-ons is not included). 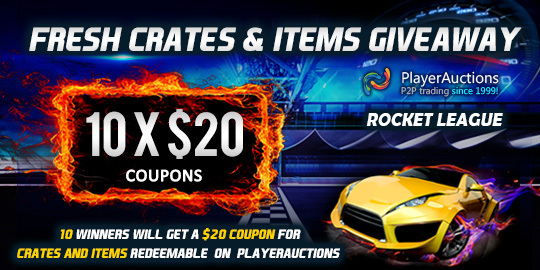 Prize: Each winner will get a $20 coupon for Rocket League. 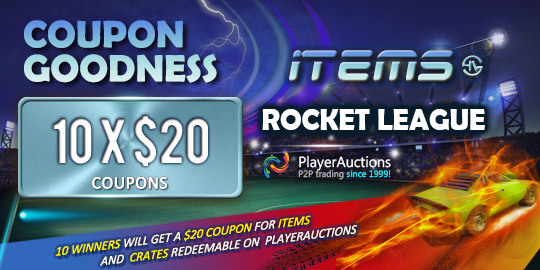 Coupon could be redeemable for any Rocket Leauge Items on PlayerAuctions . 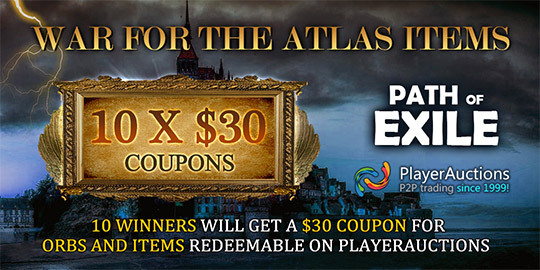 Prize: Each winner will get a $30 coupon redeemable for any Path of Exile Items on PlayerAuctions . Prize: Each winner will get a $50 coupon for Old School RuneScape. 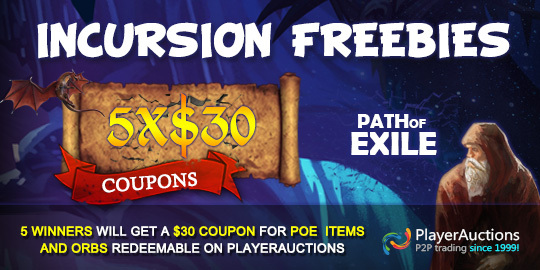 Coupon could be redeemable for any OSRS Gold/Accounts/Items/Power Leveling on PlayerAuctions . 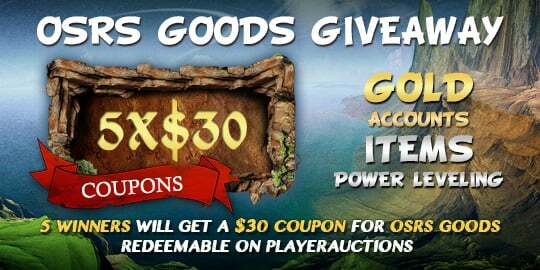 Prize: Each winner will get a $20 coupon for Rocket League Crates and Items redeemable on PlayerAuctions Rocket League Items Page. Whether it’s stuff to amplify gameplay (Items, Accounts, Clothes, Skins, Crates, and so on), our Gleam Giveaways involve winners getting free coupons to shop in our secure marketplace. Coupons are randomly up for grabs for some badass games, including these: Black Desert Online, Counter-Strike: Global Offensive, Fornite, Old School RuneScape, Path of Exile, PlayerUnknown’s Battlegrounds, Rocket League. If those titles don’t arouse you, well, guess what? We started something new in 2018 listed in our Gaming Goodies section. Yes, we are giving away tangible gamer-related products with free shipping in the U.S. High five! The products reviews are on Geek Stuff. 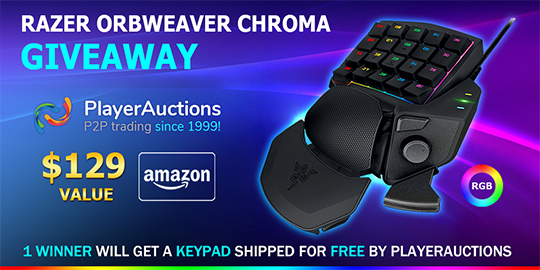 What you’ll notice when clicking on a giveaway is a rectangular widget with a depiction. Below the banner are the ways to get entries, along with the worth for each action. A variety of ways to join are available. Signing up is free, and there are no pesky hidden fees. You have nothing to lose by entering. All right, so you’ve completed the entries, now what? The top row above the banner is a snapshot of your completed entries and the days remaining for the giveaway. Once that day gets to zero, we go to work. The winners get drawn randomly according to entries. The golden rule to increase your probability of winning is this: the more entries under your belt, the higher chances of winning. We’ll announce the winners on the Gleam app, showcasing their names and a picture or avatar. Afterward, we’ll email the winners. If you don’t want to reveal your full name, no problem; we’ll keep you under the radar. Keep in mind that PlayerAuctions reserves the right to decide the winners. All decisions are final. So, now that you’re up-to-speed with our Gleam Giveaways, the ball is in your court. If you strike out on a giveaway or two, no worries; we have coupon freebies every month. After all, who doesn’t want to buy goodies to pump up the volume on their gameplay without trimming their wallet? 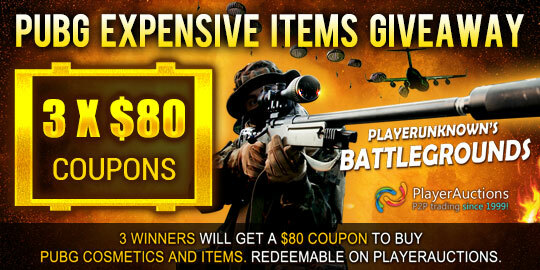 If you don’t play any of the games listed on the giveaways, we have Gaming Goodies too. Keep an eye out for future giveaways and the latest blog articles for hot games!